A beautiful specimen of Aphyolebias rubrocaudatus. 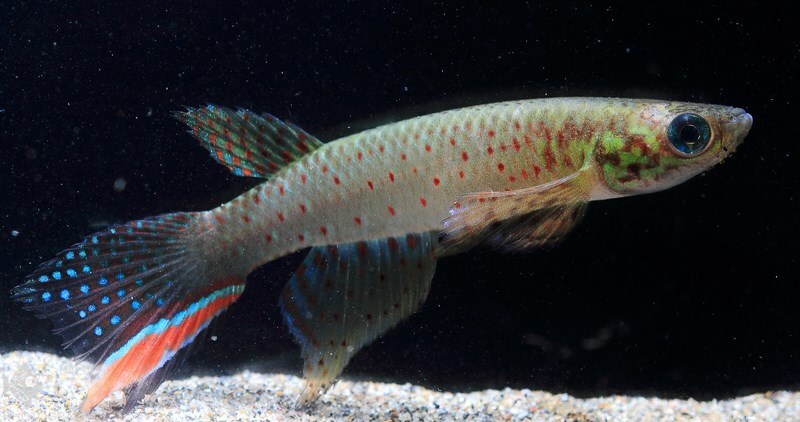 These are annual killifish found in the Amazon river basin in South America. It was drizzling in the morning at 7:00 am when I woke up. Brian had prepared a delicious breakfast of scrambled eggs and fresh fruit juice. For a few minutes it seemed like this drizzling would convert into hard rain and once again we would not be able to go out for collection, but in the next half an hour it cleared up and sun came out. Light poured in from above and we could see some blue spots in between thick clouds. Felix (our local guide) came at around 8:15 AM. We were all set to go out. I had packed all my camera gear and nets. Brian had packed the bags in which we would pack the fishes that we hope to collect. We loaded all our stuff in the motocar and started off. We stopped at a local market to buy a few things—first on the list was rain ponchos for ourselves. For our lunch in the jungle, we bought a few juanes. These are like tamales wrapped in bijao leaves instead of corn husks and are stuffed with rice, egg, olives and chicken before being tied in a neat single-serving bundle and simmered. This is one of the main dishes of the Peruvian jungle cuisine. When Brian and Felix were buying juanes, I made this small video of the market. Peru is another big market for many Indian motorcycle making companies. 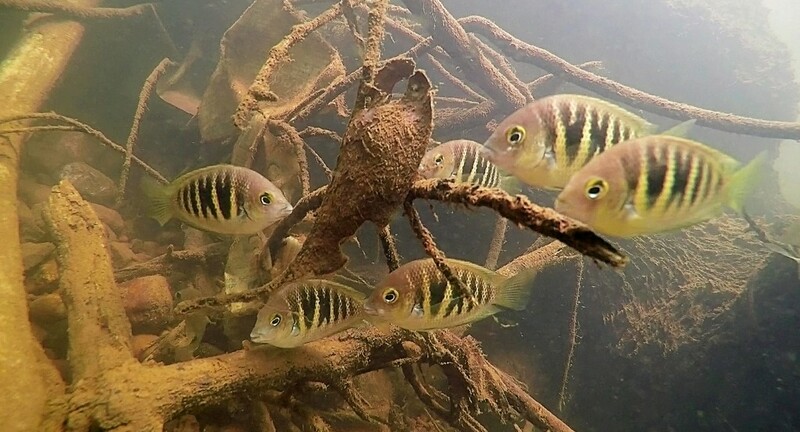 Our next stop was the place we visited on our very first day (where we saw a Pleco fanning eggs). 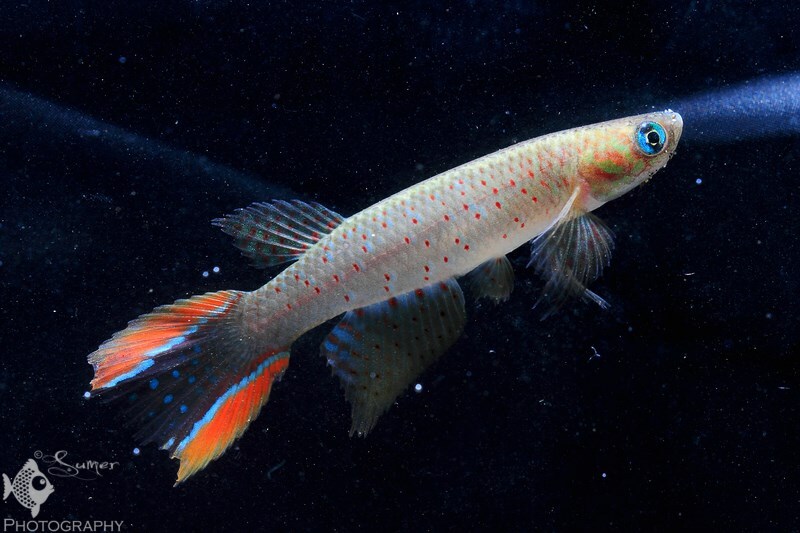 These shallow pools are the home to beautiful Peruvian killifish, Aphyolebias rubrocaudatus. They kept jumping from one such pool to another, laying eggs in every pool. Once there, I wet my net first. I was doing the “deep scoop” method and caught nothing in the first few dips. 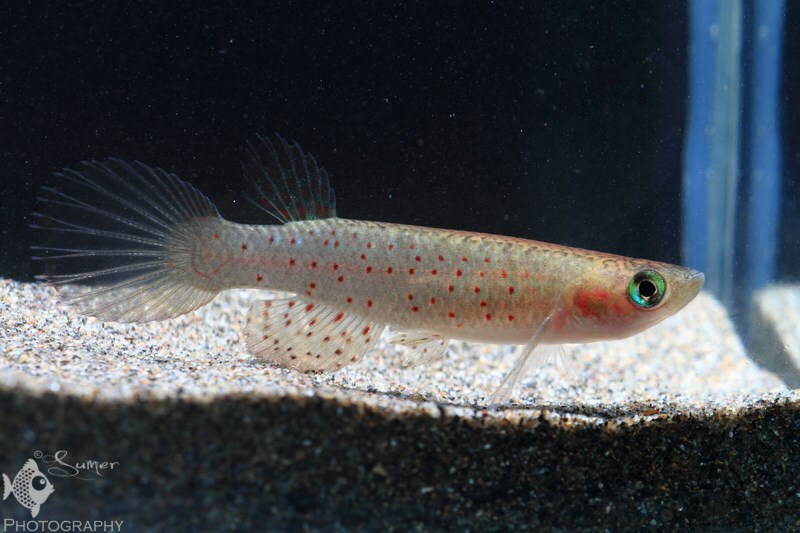 Then Brian explained to me that killifish stay near the surface so doing a deep scoop is really not the way to catch them. You do a “surface scoop” in which you just swipe the surface of the water with your net. 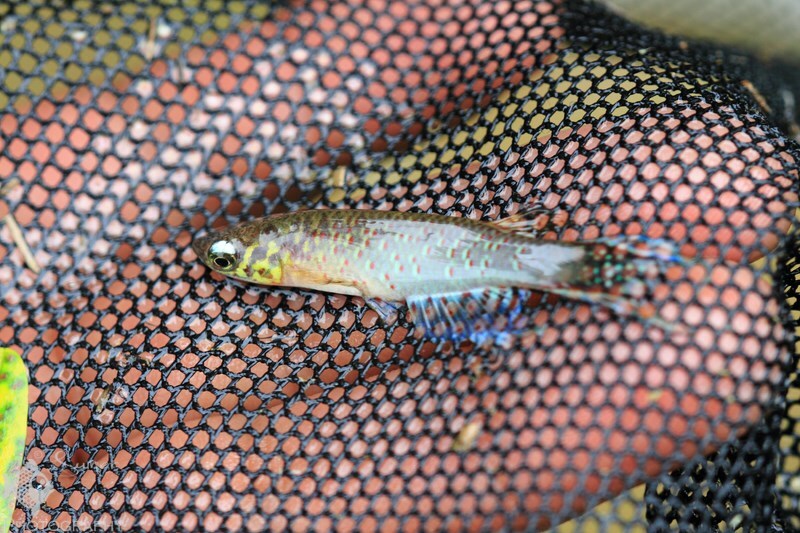 I tried doing that and in the next few attempts, there it was, my first killifish catch in the Peruvian rainforest! 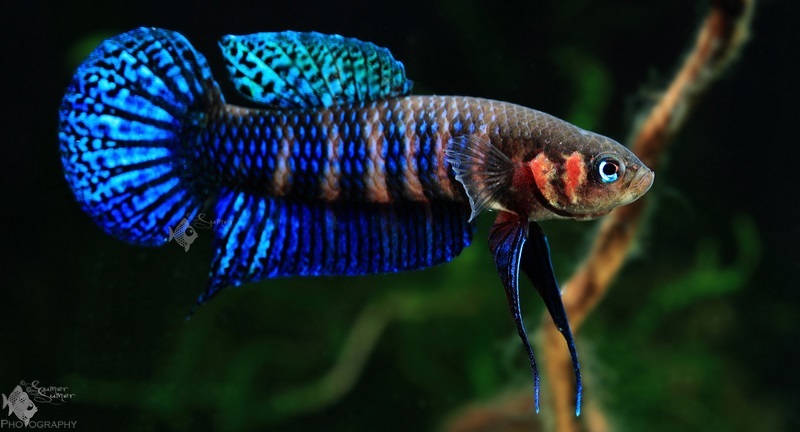 That killifish was amazingly! 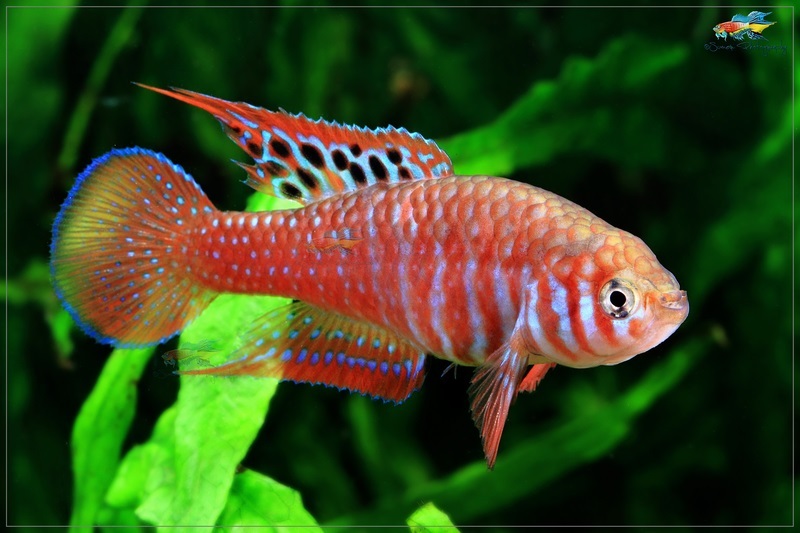 Orange, red with blue spots…just gorgeous. 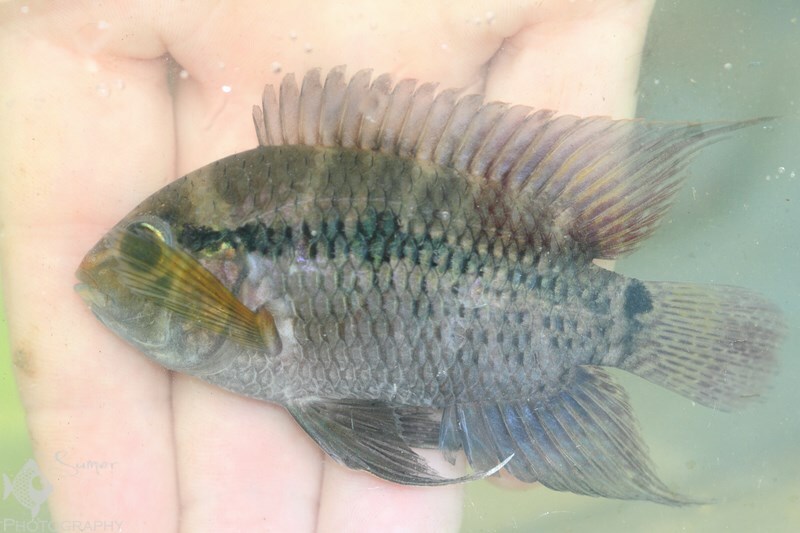 Aphyolebias rubrocaudatus, my first catch in Peru. 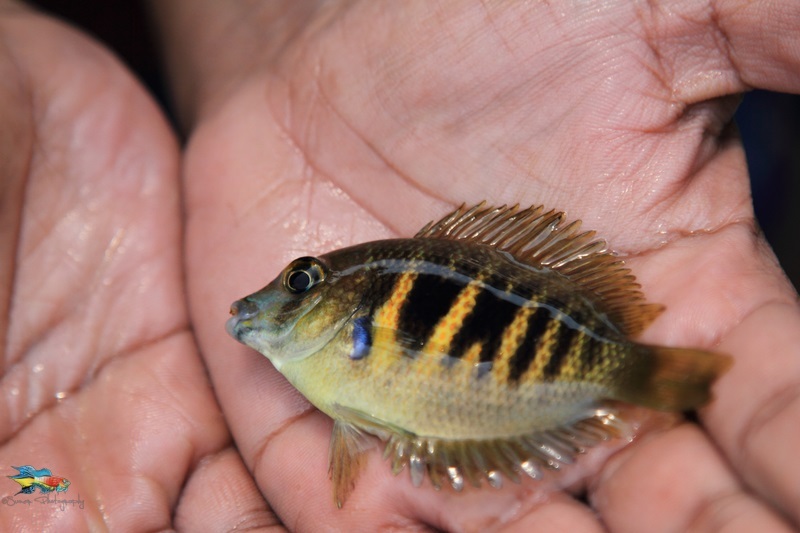 Freshly caught Aphyolebias rubrocaudatus in my photo tank. 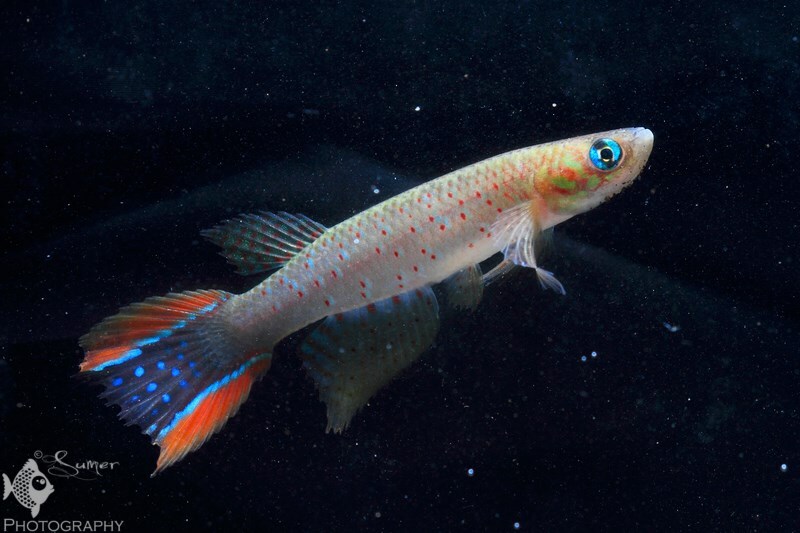 This colorful annual killifish had completed half of its life by February. 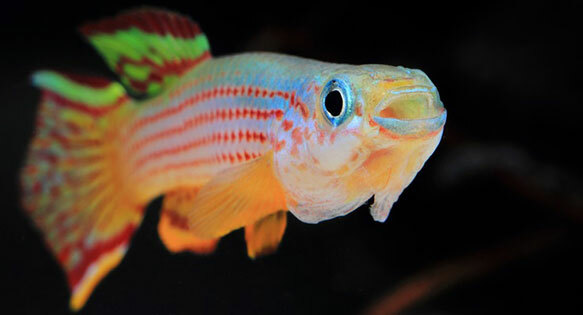 Cichlosoma boliviense is a very rare species known simply as the Bolivian Cichlid in the hobby. 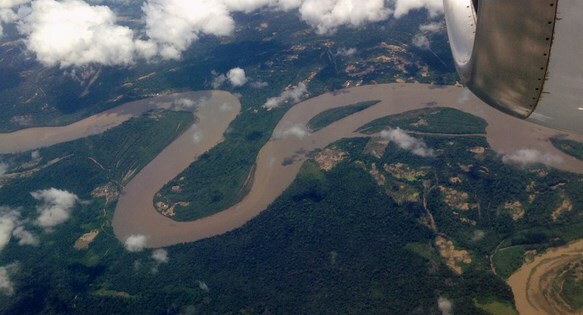 It is found in the Amazon river basin in Peru, Bolivia and northern Brazil. 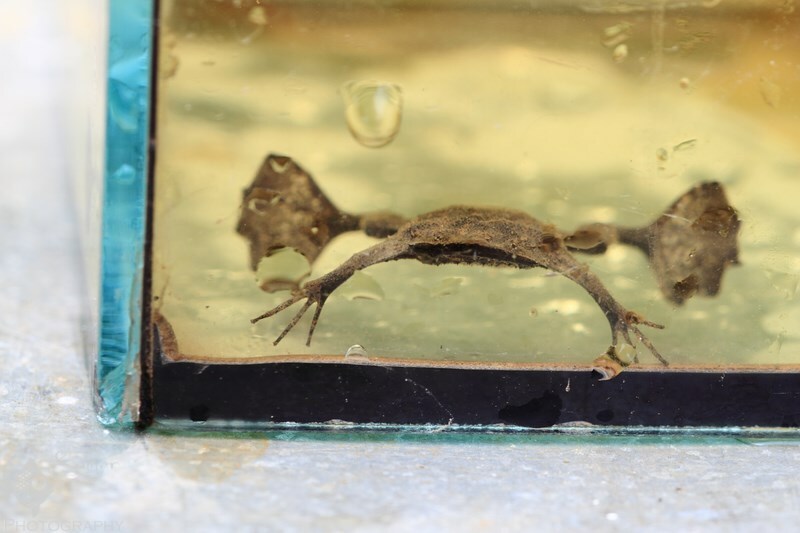 We caught this specimen in a 4-5 feet deep permanent pool. We released it at the same place we caught it. We released it after taking a few pictures. 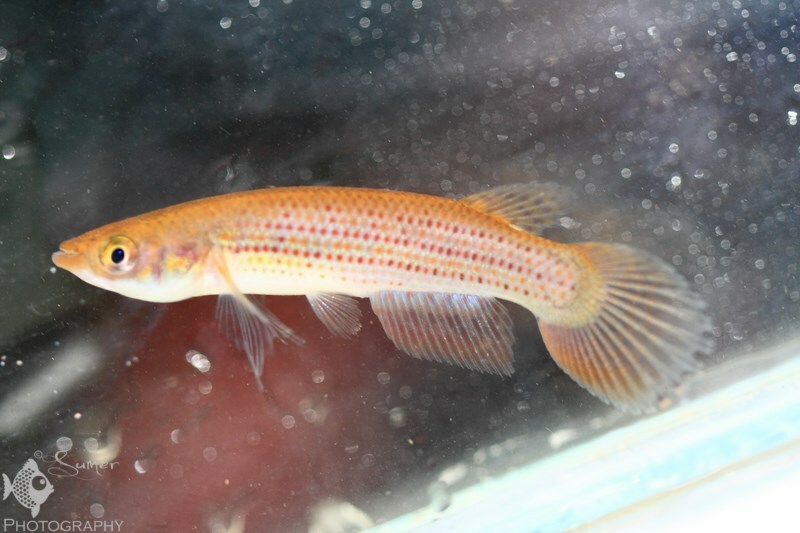 Then we kept collecting killifish, wolf fish and porthole catfish. 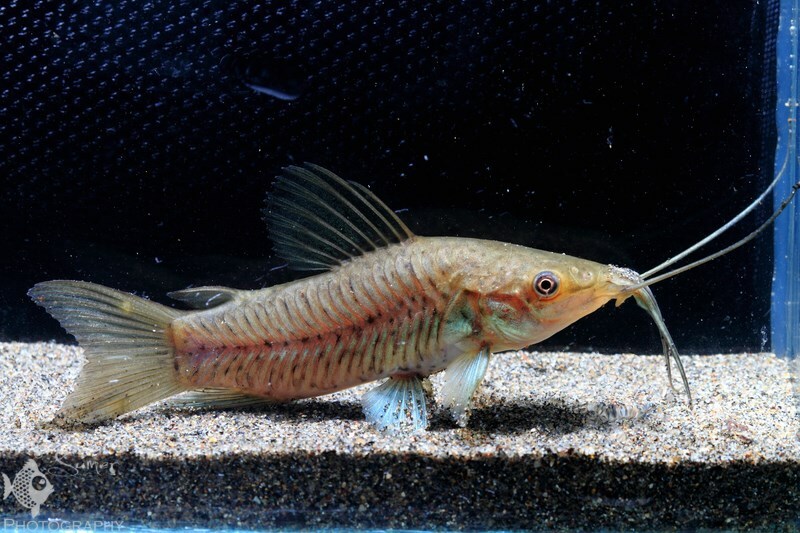 Dianema longibarbis, a peaceful catfish that is usually called Porthole Catfish. 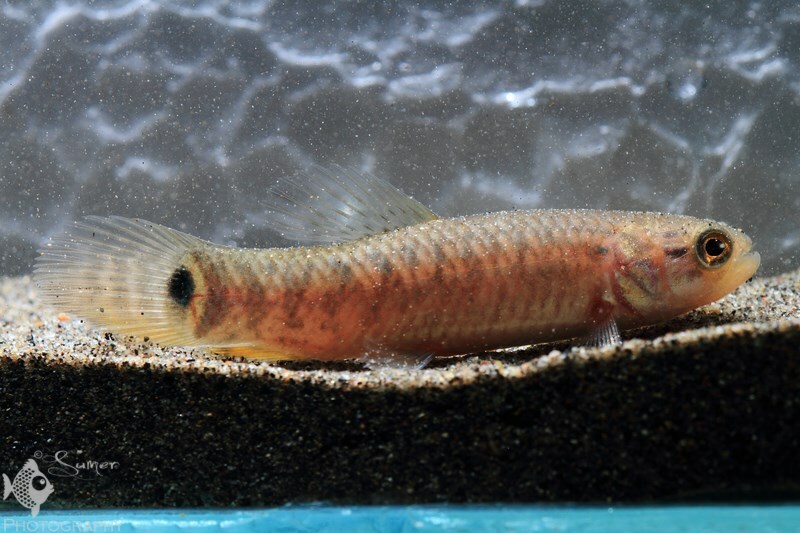 These get around 3.5-4″ in length and are found throughout the Peruvian and Brazilian Amazon river basin. 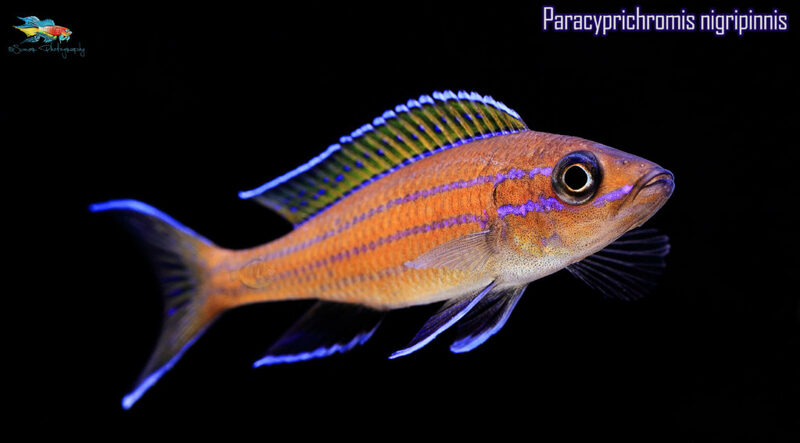 Dianema is a very small genus with only two fishes in it – Dianema longibarbis and Dianema urostriatum. The latter is found in Brazil. Close up of mouth and eyes. 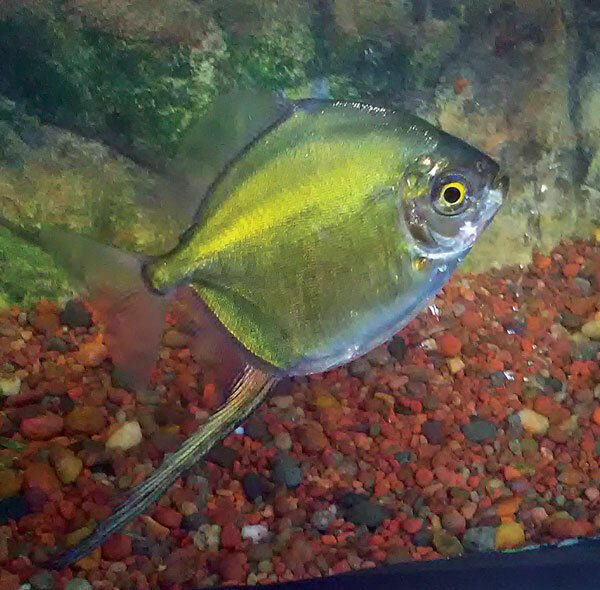 These fish have iridescent green color throughout the body. 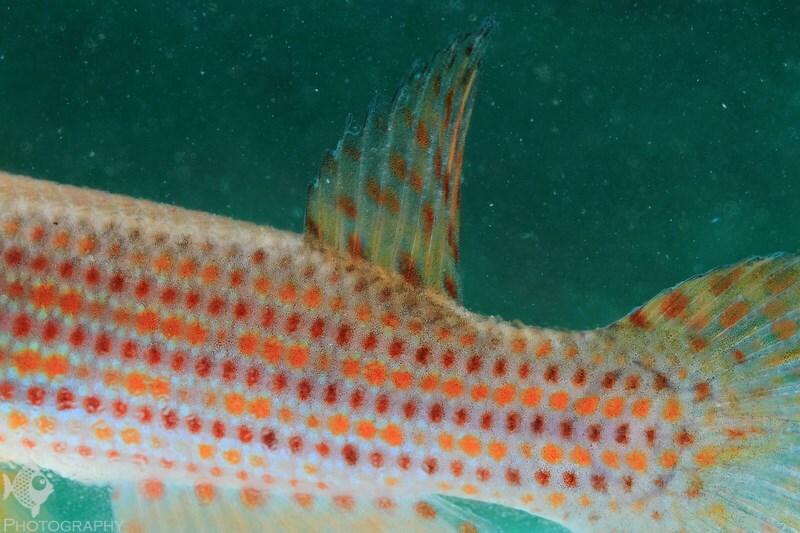 Erythrinus sp. 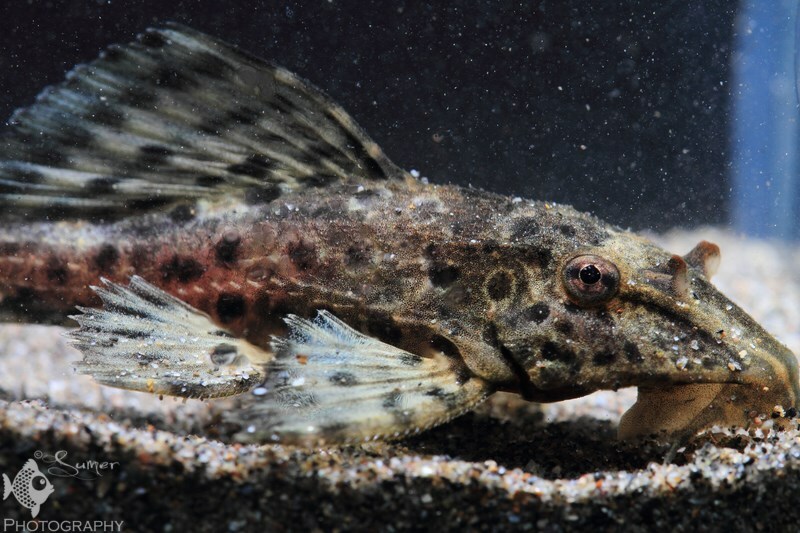 “Peru” is commonly known as a wolf fish. 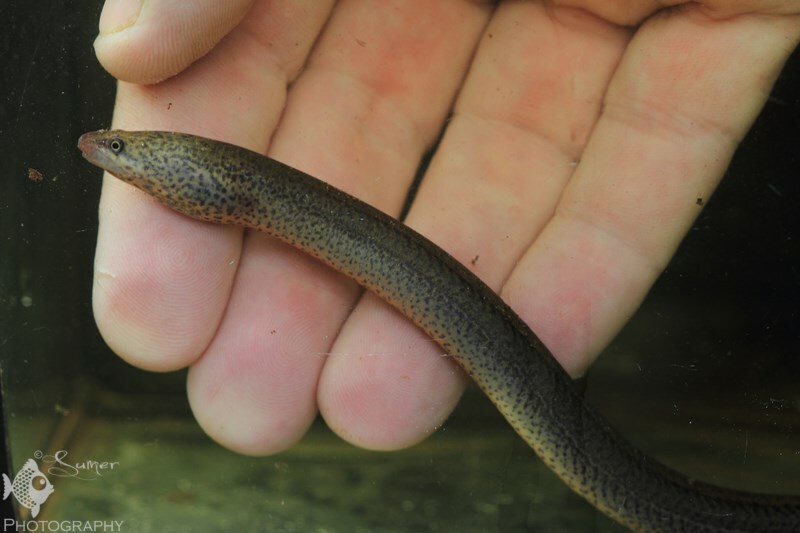 They can reach lengths of 35-40 cm. Their bites can be nasty. These were in abundance where we were collecting. While catching the Aphyolebias rubrocaudatus I noticed a very interesting phenomenon. 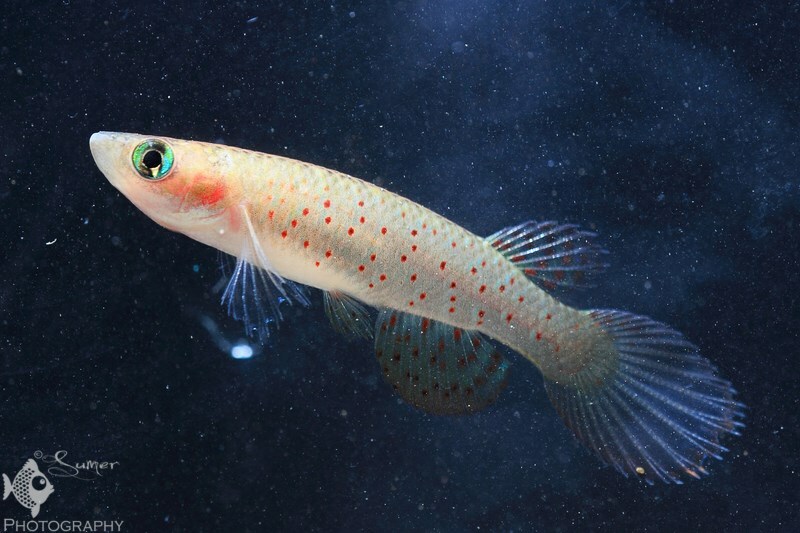 From the same pool we were catching two different “forms” of this killifish. One form had two orange lines on its tail and the other form had only one. 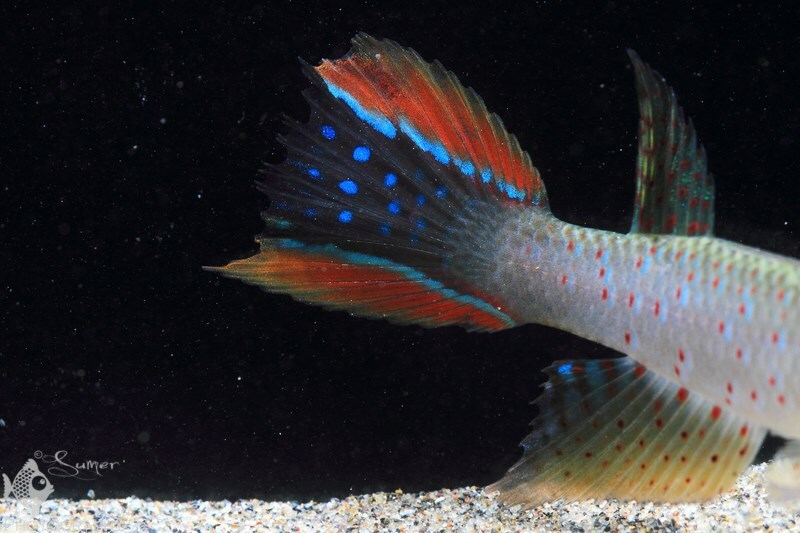 They are likely the same species because they came out of the same pool and look similar except for the bars on their tail. Females had no difference in their pattern. 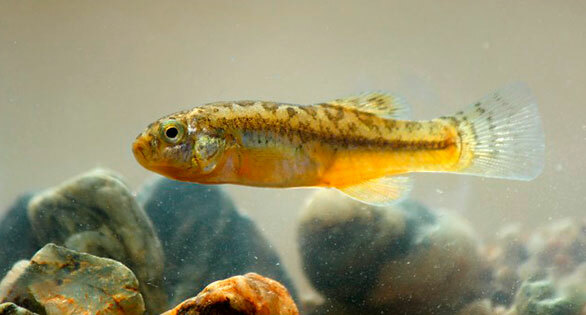 The Form 1 of Aphyolebias rubrocaudatus. Notice two bars on the tail. 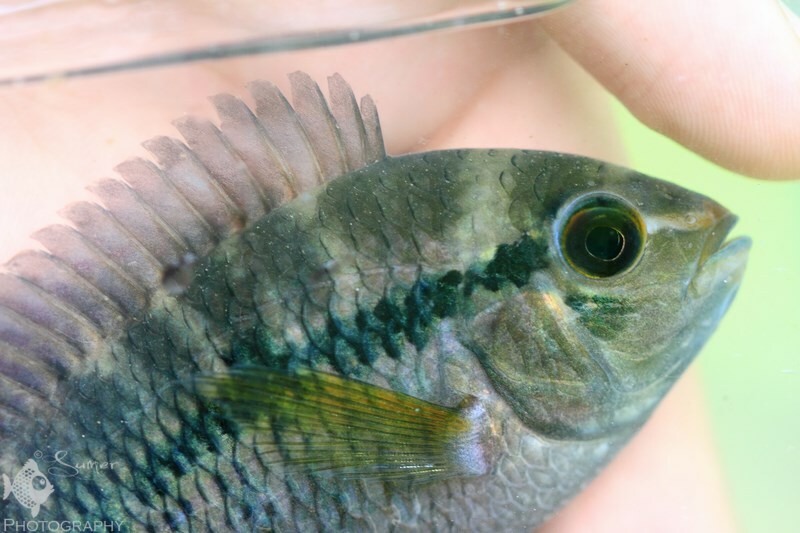 Close up of the tail of Form 1 Aphyolebias rubrocaudatus. 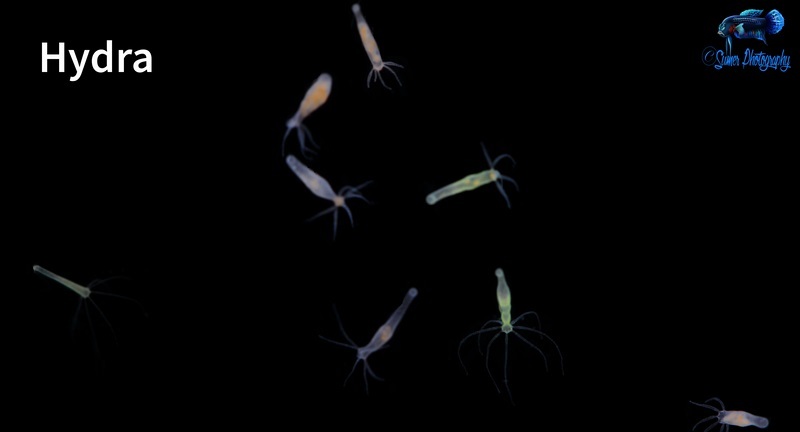 Form 2 of Aphyolebias rubrocaudatus; notice that it has only one bar. Close up of the tail of Form 2 Aphyolebias rubrocaudatus. Aphyolebias rubrocaudatus female. 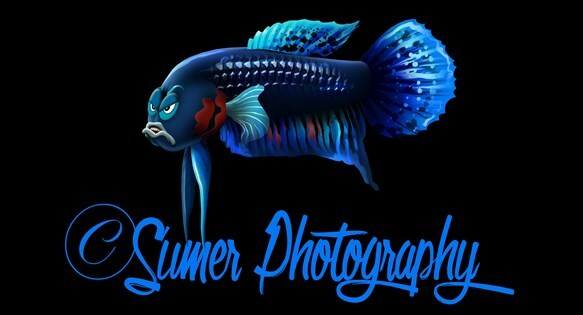 They have color on their body but not on fins. 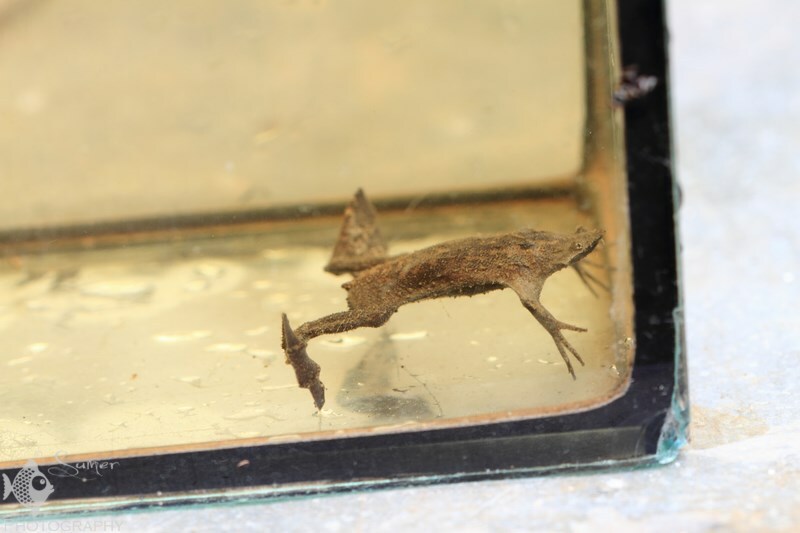 There’s usually a very small difference in the body length between males and females. Aphyolebias rubrocaudatus male and female. 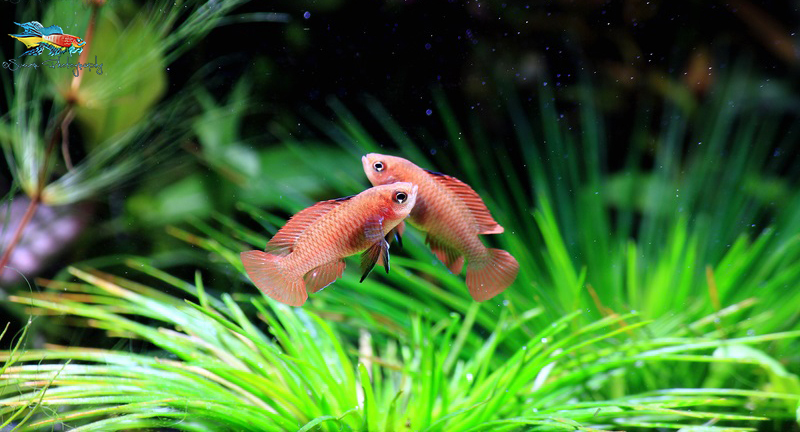 Except for the fins, their body length is almost same. Then in a nearby pool, we found another very interesting fish. It was Eigenmannia macrops. 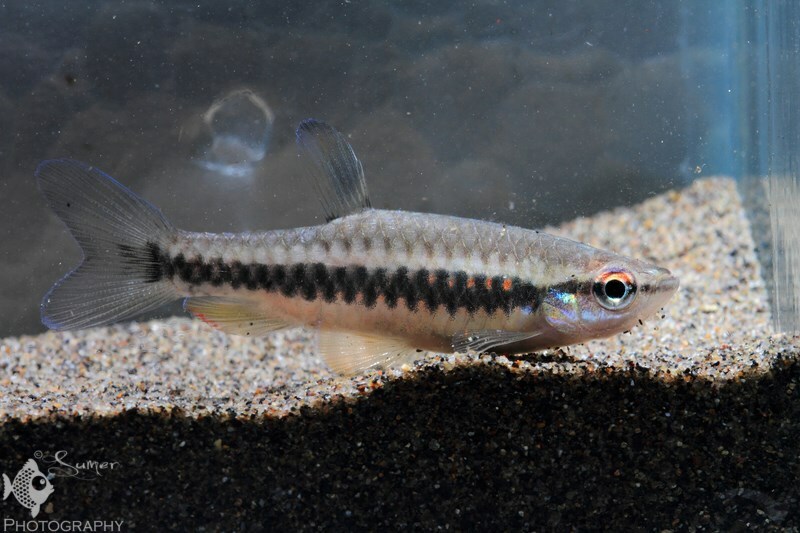 It is a glass knifefish species found in the Amazon river basin. Then a few minutes later Felix gave us a shout that he had caught “Killi grandes” as known in the local language. These are Moema quiii. 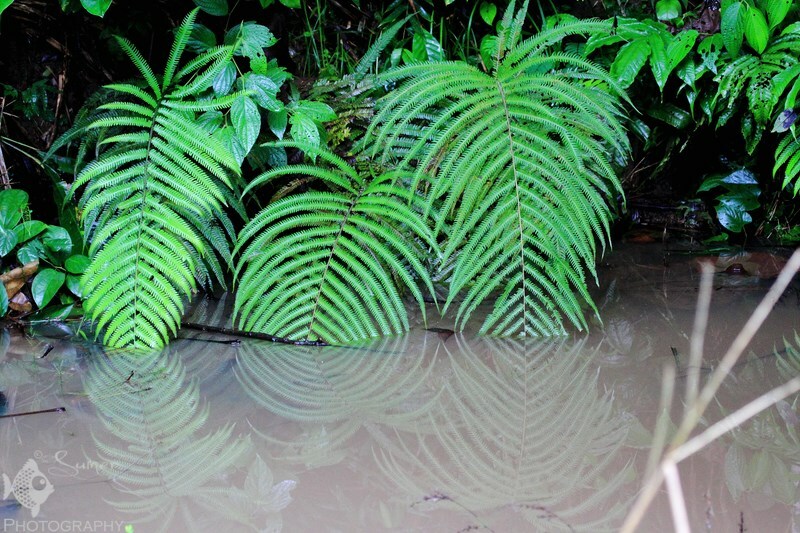 I had been keen to collect some “Killi grandes” during my trip. 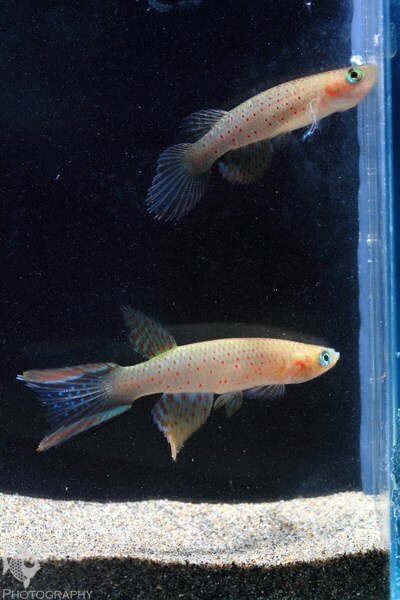 They get huge by killifish standards; up to 4-5” long. 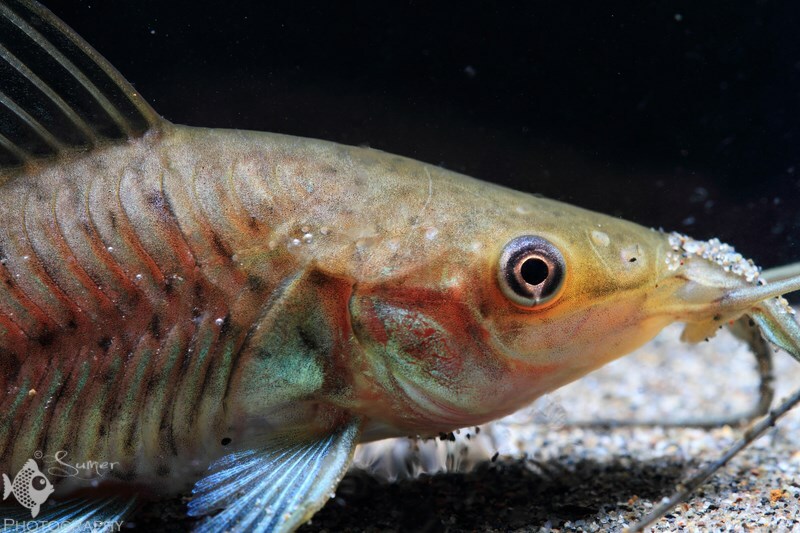 I went to him to see Felix’s catch and it was really big – bigger than any killifish I had ever seen. Moema quiii or Killi grandes. 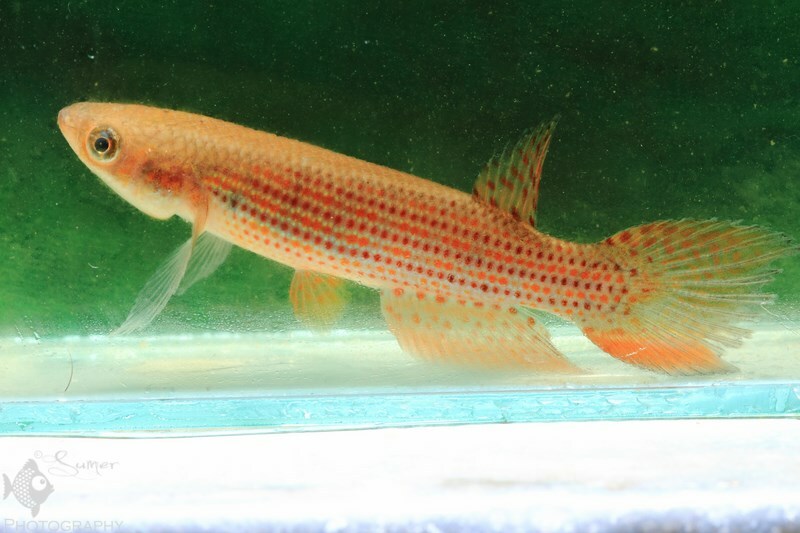 These big and magnificent annual killifish are the pride of Puerto Maldonado area. 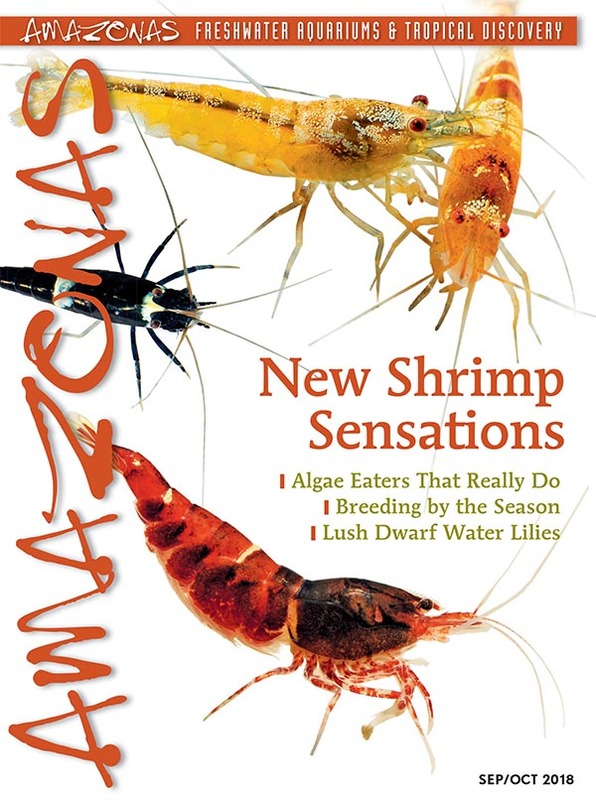 “Killi grandes” gobble down any smaller fish that fit in their mouths. A close up of the beautiful pattern on their body. Moema quiii habitat. 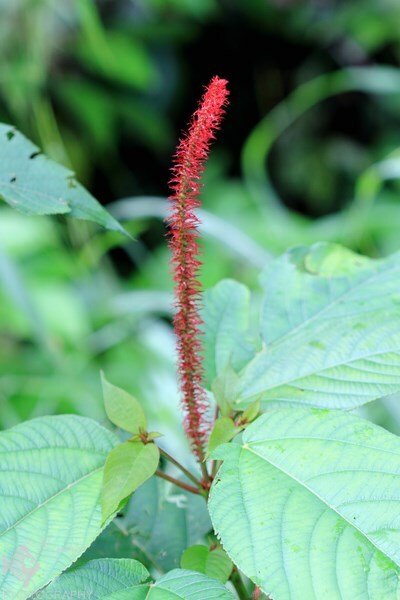 Moema quiii are more active during the night, unlike Aphylebias rubrocaudatus which are usually active in the day. In one of the scoops, Felix came up with a small frog. On a close inspection Brian confirmed that it was Pipa pipa. Pipa pipa, commonly called common Suriname Toad, is a species of frog from the Pipidae family. 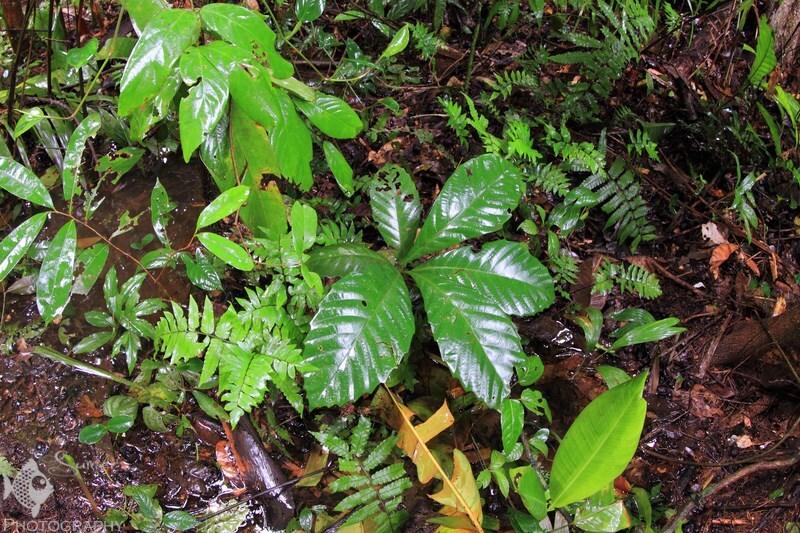 Species from this family are widely spread in the whole South America. 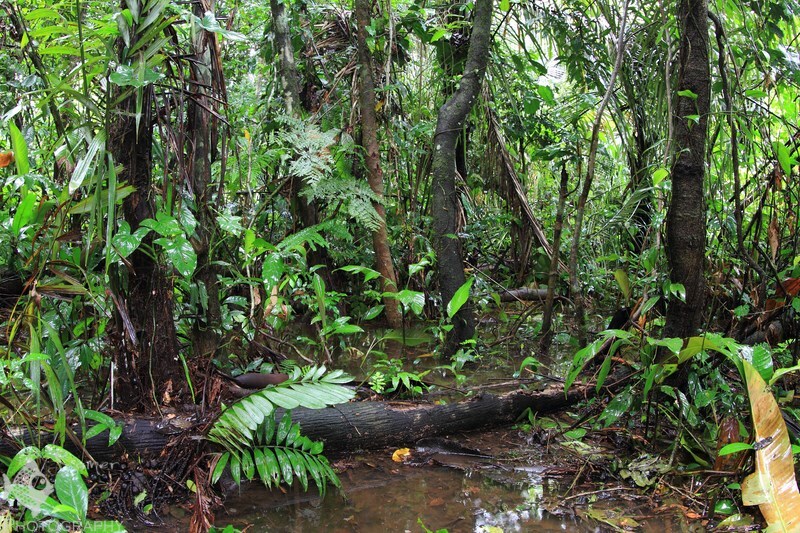 They are threatened by habitat loss. 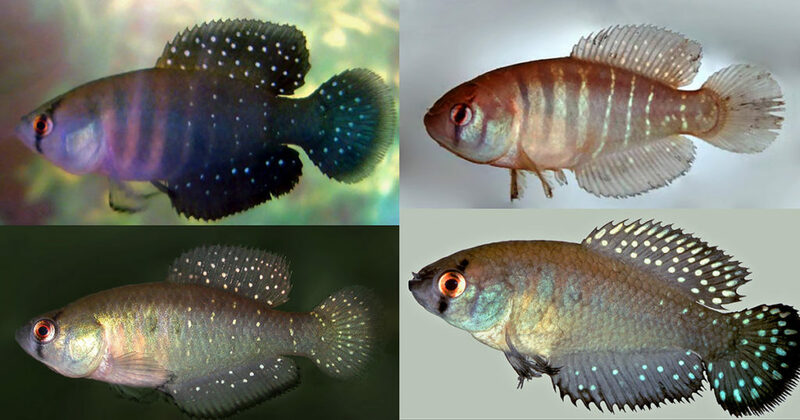 This species has a very interesting breeding behavior. Female puts the eggs on her back where they embed in her skin. When the eggs hatch, babies seem to come out of mother’s skin. 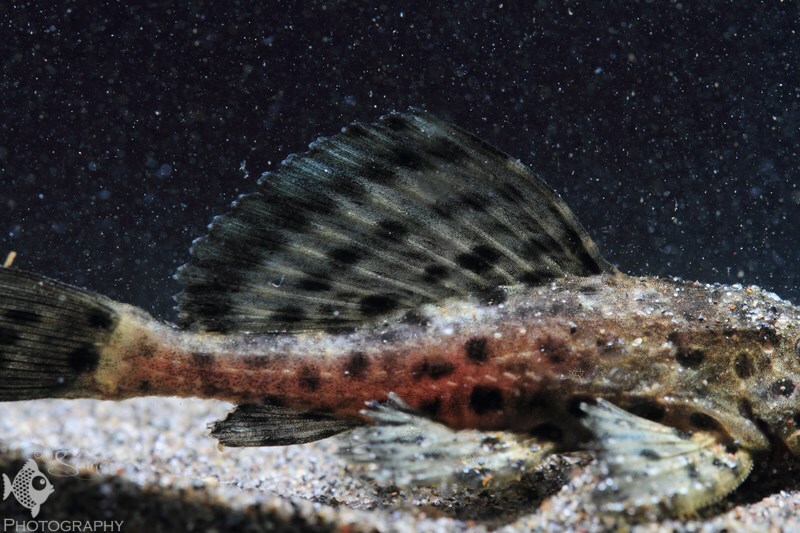 Synbranchus marmoratus are found all over the South America. They can grow upto 4-5 feet. 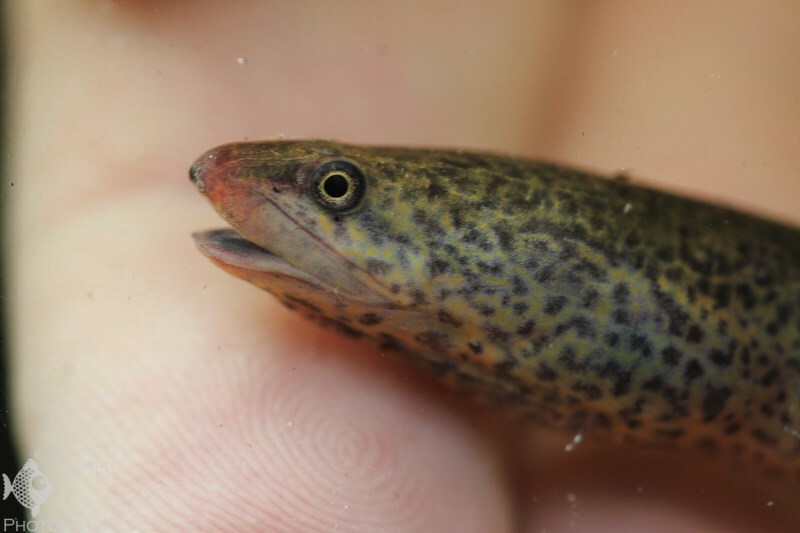 Close up of the mouth of Swamp Eel, Synbranchus marmoratus. 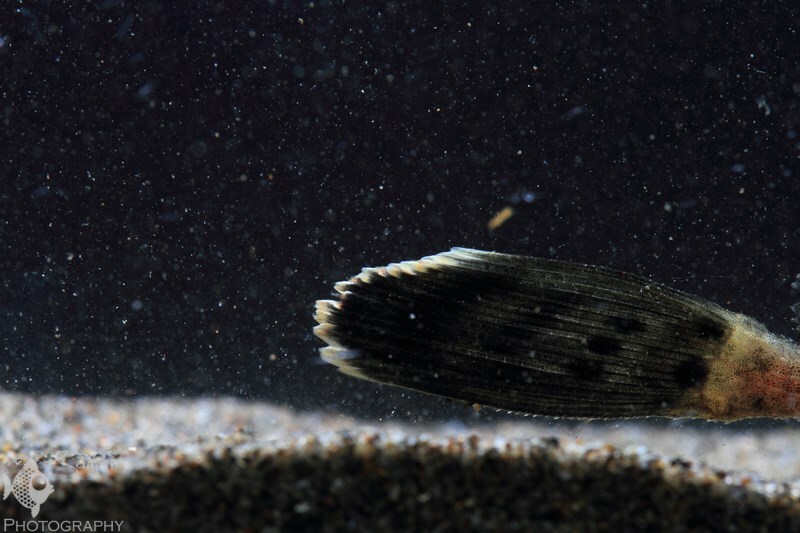 They are nocturnal carnivorous fish. Males dig holes in the mud to breed. Closeup of eyes and mouth. The pattern on its body was very interesting. It had black dots on brown body. 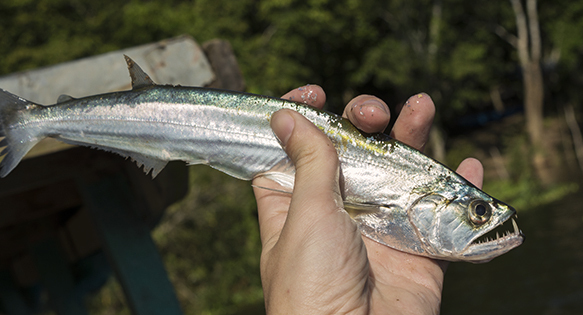 The white seam on the tail had some red color when the fish was freshly-caught. Copella sp. 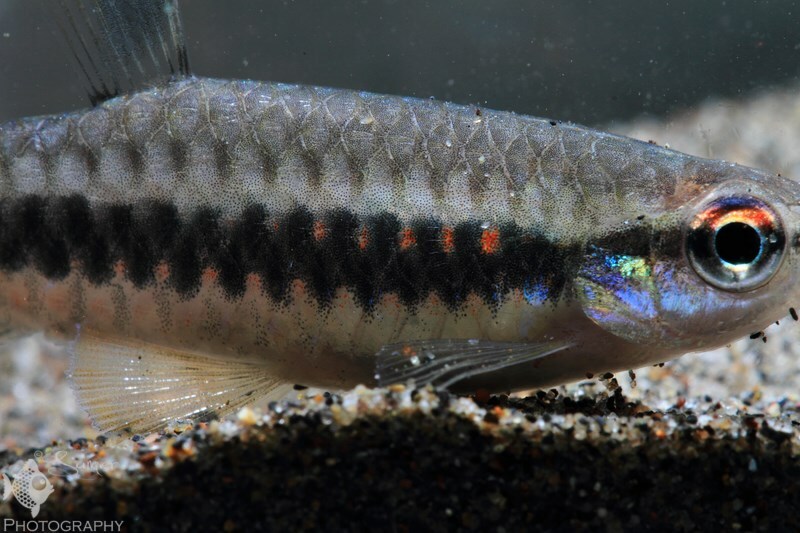 (Most probably Copella nigrofasciata), commonly called Splash Tetra . 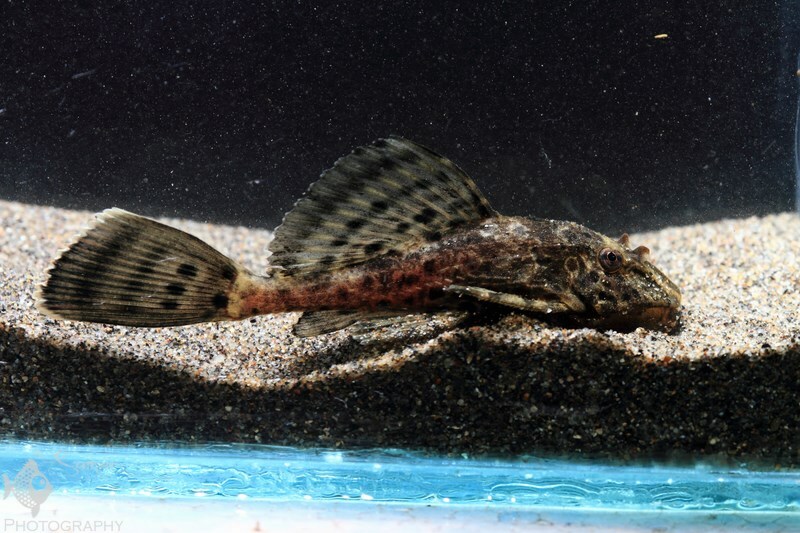 Its an uncommon fish in the aquarium trade. 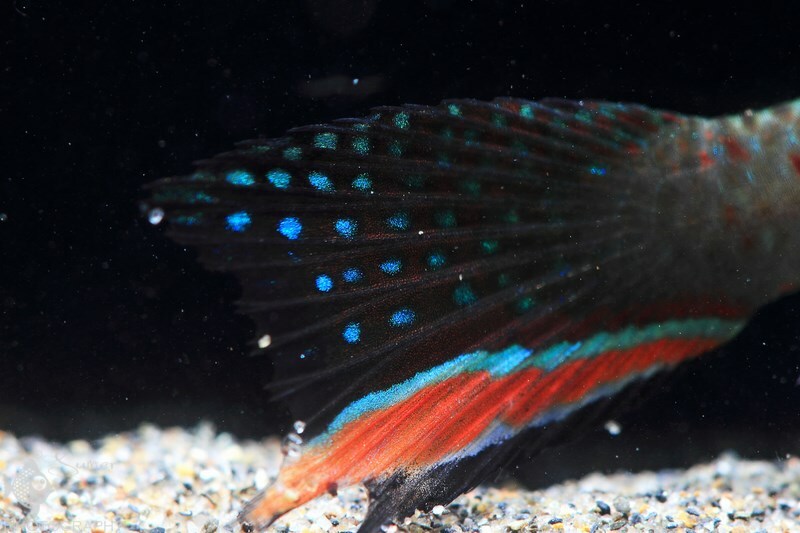 Beautiful iridescent colors on this unusual tetra. 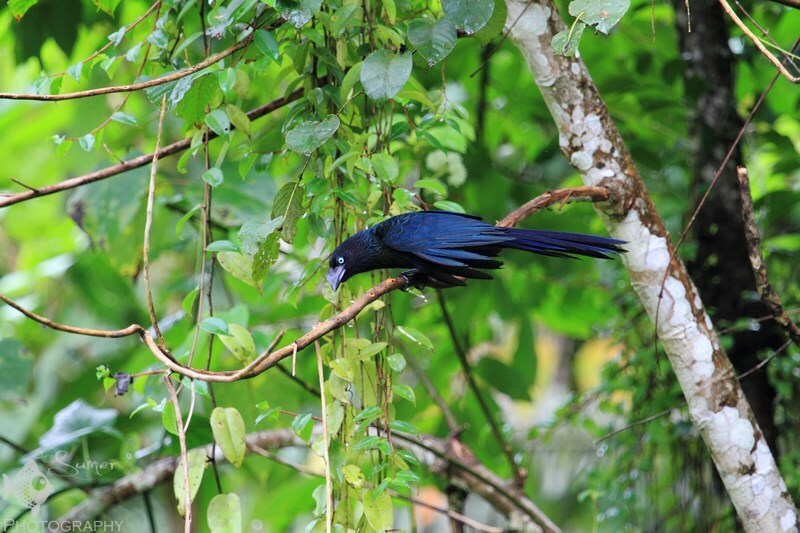 Greater ani or sometimes called Black Cuckoo, is a bird found in tropical forests of South America. These crickets are a very important part of the food chain here. 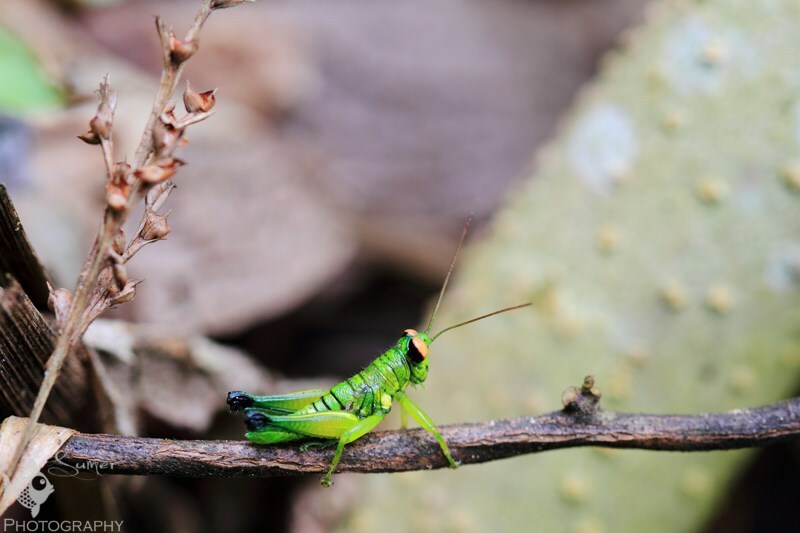 Many birds, frogs and I’m sure fishes, depend on bugs like this cricket. 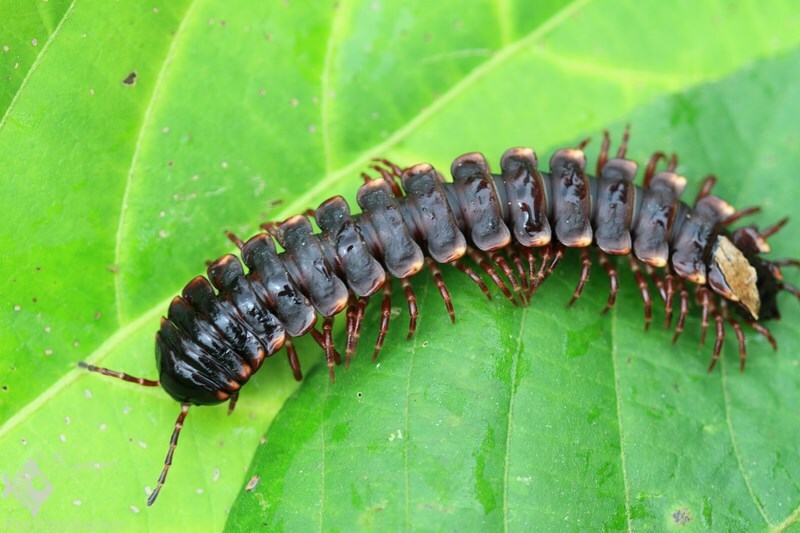 Millipedes are common animals in the tropical forests, all over the world. Every plant that I saw there seemed like a perfect fit for a riparium (an aquarium with emerged plants simulating a shoreline). Tropical flowers were blooming at this time of the year. Brian taking pictures of the fishes that we caught that day. 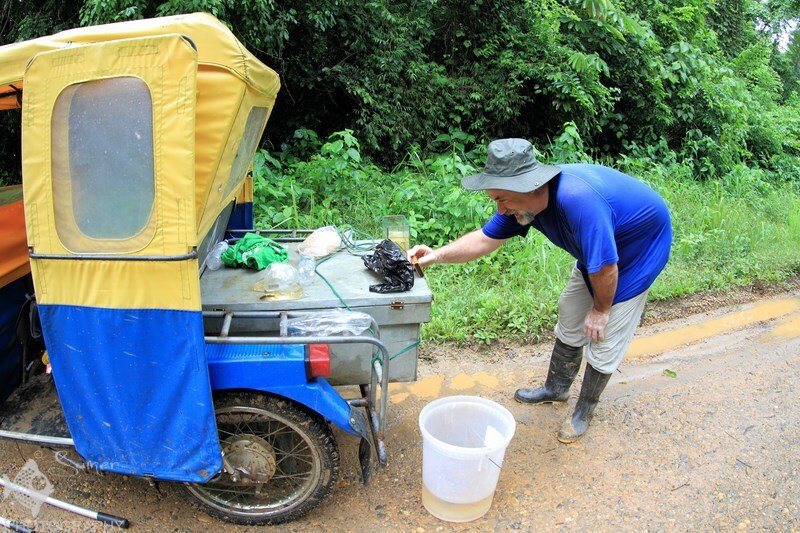 Our motocar was serving many purposes. Our group photo after a tiring day. From left to right: Felix, Brian and I. At around 4:00 in the afternoon, we started our drive back. 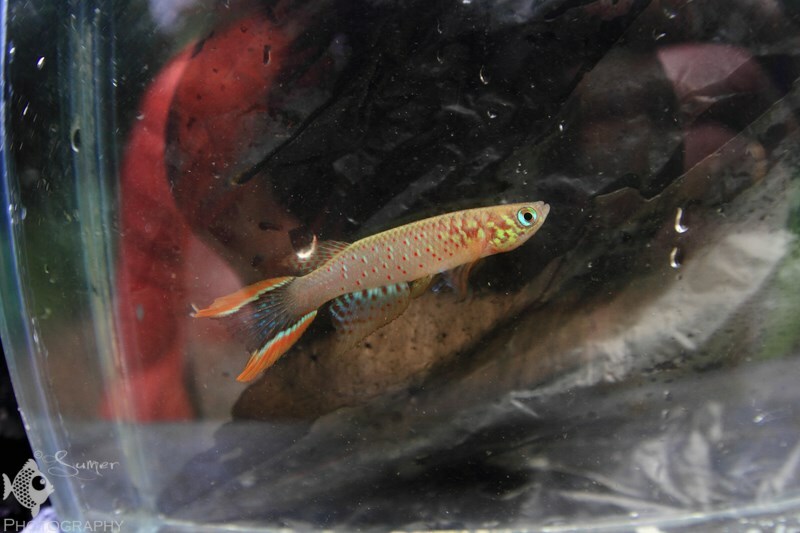 Upon reaching home, we transferred all the killifish into individual deli cups. We put other fish in the respective tanks. We were all rather exhausted by then. The repeated action of netting that we did the whole day had brought some soreness in our arms. For dinner we went out to a local pizzeria called El Hornito (The Little Oven). After this delicious dinner and back home, I emptied my memory cards from the camera into a hard disk. This was another interesting issue while I was planning for my trip. I was thinking about the ways that I can empty my camera memory cards into another storage device when I am in Peru. My first option would have been taking my laptop. I have an Alienware m14x which weighs around 7 pounds, not to mention it’s simply a large piece of equipment to transport. I discovered some devices in the market which have card readers and hard disks in them. You just plug in your memory card and they copy the data to those hard disks. The downsides to these devices is that first, they cost a lot; second, their hard disks are usually around 200Gb. My memory cards alone can save around 256 Gb of photos. These devices weren’t a good fit either. 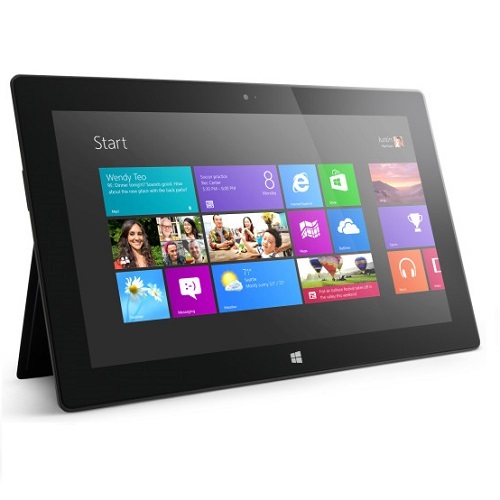 I started looking into tablets. Models with USB capabilities were priced around $400-500. I wanted a less expensive solution,which I found in a Windows Surface RT. It was around $180 refurbished and had a USB 2.0 port. It was not as good as having a Thunderbolt or USB 3.0 connection but still, it was a decent solution. I made the purchase, and thankfully it made my life so much easier while on this expedition. 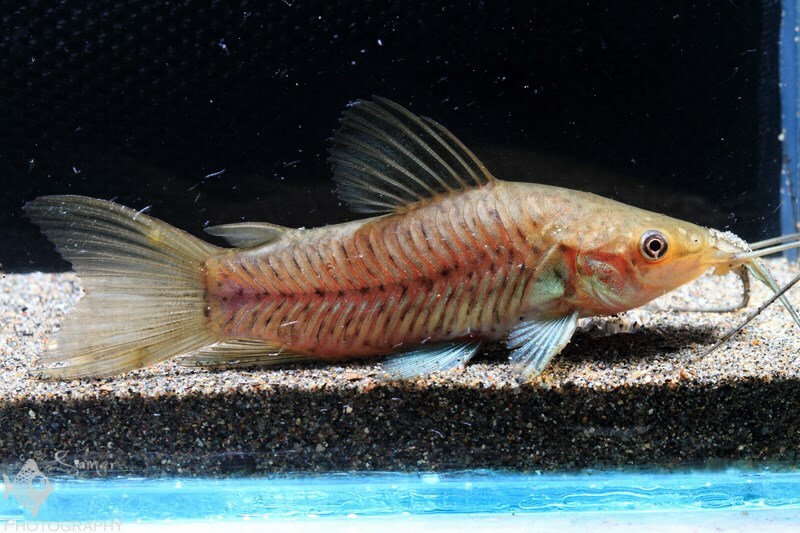 In the next few days, we caught a very beautiful Apistogramma. 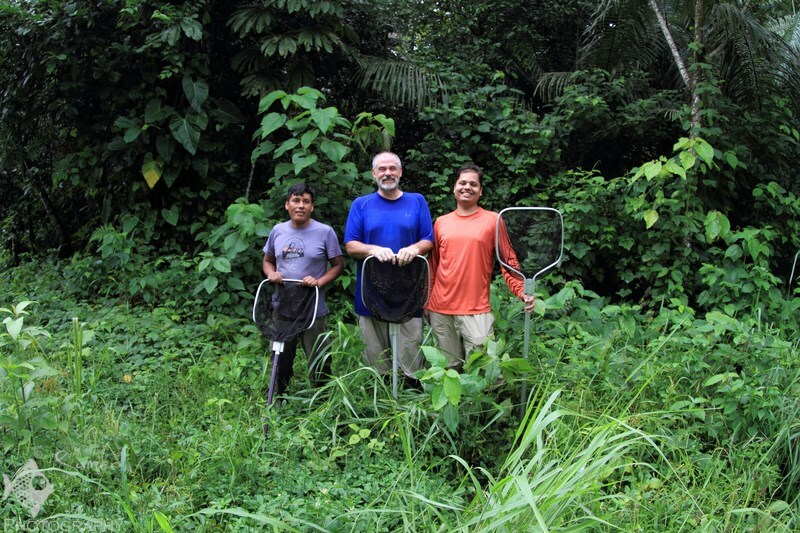 My trip became even more exciting when we caught a South American lungfish. Stay tuned and watch this space for the next blog entry. 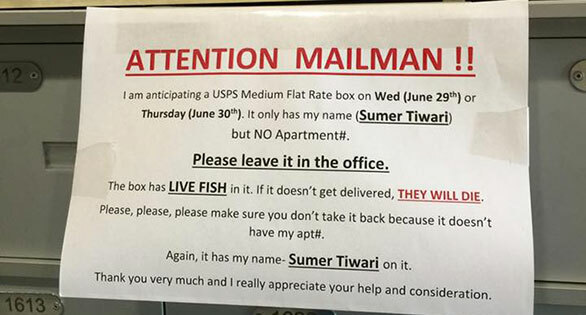 Till then, take care and keep loving your fish.